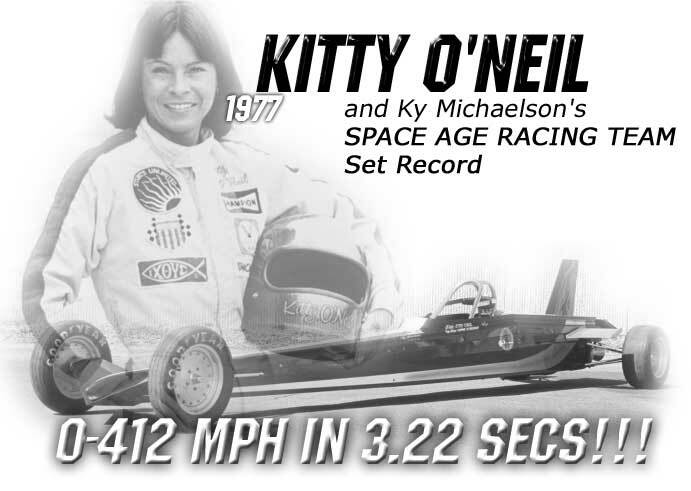 1977 was the year… Kitty O’Neil was the driver…Ky Michaelson was the mastermind…Space Age Racing was the team… a record in the quarter-mile was the goal. Not only did the team reach their goal, they smashed it! Kitty ran the quarter-mile in 3.22 seconds at a speed of 412 mph. Ky has a history of setting or breaking speed records that spans over 20 years. Many of those records still stand to this day. For approximately 10 years, Ky traveled across the U.S. going after landspeed records using rocket powered vehicles. He set 72 state, national and international records with Hydrogen Peroxide powered vehicles. His cars were the first to run sub fie and sub-four second runs on an NHRA track.They were also the first to run 300 and 340+ mph on an NHRA track. Ky had the first Funny Car to run in the three second range at over 300 mph. These cars set records in the eighth-mile, 500 meter and the Kilometer as well. As mentioned previously, many of these records still stand to this date.